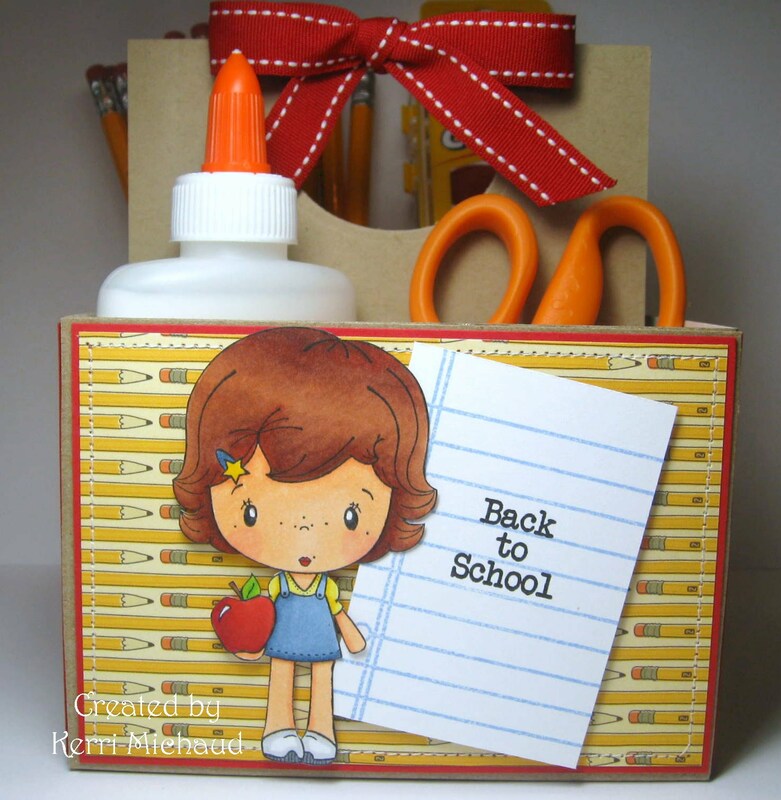 All That Scraps Guest Designer Week 4~Back To School! It's time for another Monday Spotlight on the All That Scraps Blog which you can see HERE. Today they are featuring this little back to school caddy I created by using instructions I found HERE. 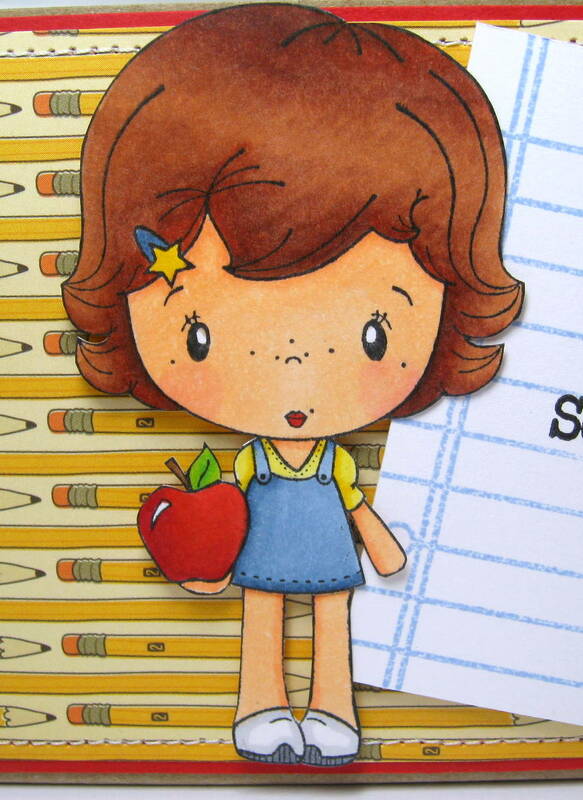 I used this adorable Teacher Honey image, as well as the notebook and sentiment from the PTI set school time. I just got home from dropping my daughter off at her first day of Kindergarten:( I really didn't think I would get emotional because she has gone to preschool the last couple of years, but another mom had to hand me a kleenex on the way out the door! I cried all the way to the car LOL! They really do grow up fast. Here is another project I created using the Amy R. set The Best. This set comes with several large sentiments like the word friend, and then several smaller sentiments to go with them, like the happy birthday. I love it! I used Balloon Emma from the Sugarplums Party set. Isn't she just adorable?! 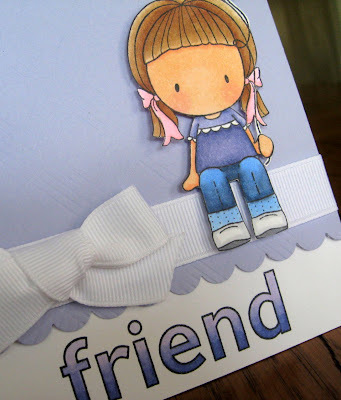 I colored the word friend using a tutorial I found on Amy's blog HERE. I just love the effect! WOW!!! 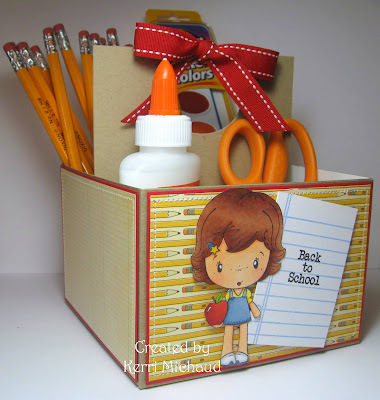 What a great project your 'back to school' caddy is!!! GREAT job on this and the image and your coloring is soooo adorable! LOVE it!!! The card is beautiful, too! These are FANTASTIC Kerri! LOOOOOOOOOOOVE the caddy...that is TOTALLY fab! Love these projects!!! They are awesome!!! Awww, Kinder kids are at such a cute stage. Yesterday I dropped my son off for his first year of college....it hasn't "hit me yet", but I'm sure it will when I go into his room. Yeah, I cried when I dropped both you and your sister off at kindergarden! And cried when you graduated from high school. May have cried when you started jr. high, don't remember. And now you've made me a gramma 3x! Your card and your box are adorable. Great job. Glad you had fun this weekend. What a cute box. How fun. I love the birthday card too. TFS. Kerri, your cards are wonderful. Your little tote is such a great idea. Your coloring is awesome. Thanks for sharing your talent. Love your B2S project and that card is so cute! They do grow up too fast! My eldsest started middle school, seems like yesterday I walked her to kinder! sniff!sniff! These are so cute! I love your holder! OMGosh!!! That caddy is the coolest thing EVER!!! Great job Kerri and your coloring is perfect and as always you've chosen the best paper. ATS is so lucky to have you Guest Design for them!! Sounds like a really fun weekend, what a fun treat to have box seats!!! This caddy is so cute! Love the Cosmo Cricket paper...you're so good and bringing out older stuff and finding the perfect use for it! Good to know you had a great time watching the game. What a cute creations you've made, wonderful! WOOOWEEE Kerri these are just FABULOUS!!! LOVE LOVE your back to school caddy!!! AWESOME creations sweetie! Wow Kerri!! Too cute!! Both of these!! Your caddy is so beautiful and perfect for back to school. The birthday card is so soft and beautiful. Gorgeous coloring! The kids sure do grow up fast. It is sad and exciting at the same time. I love to see them grow and learn to do new things but at the same time I want them to stay small. I hope your dd has a good year at school! So beautiful card and box Kerri,I love the images and colours. Oh how stinkin cute! I like the little catty for school, how stinkin cute and creative. Your card is awesome, clean and classy. Wow! What a fun school project! Love the box created! 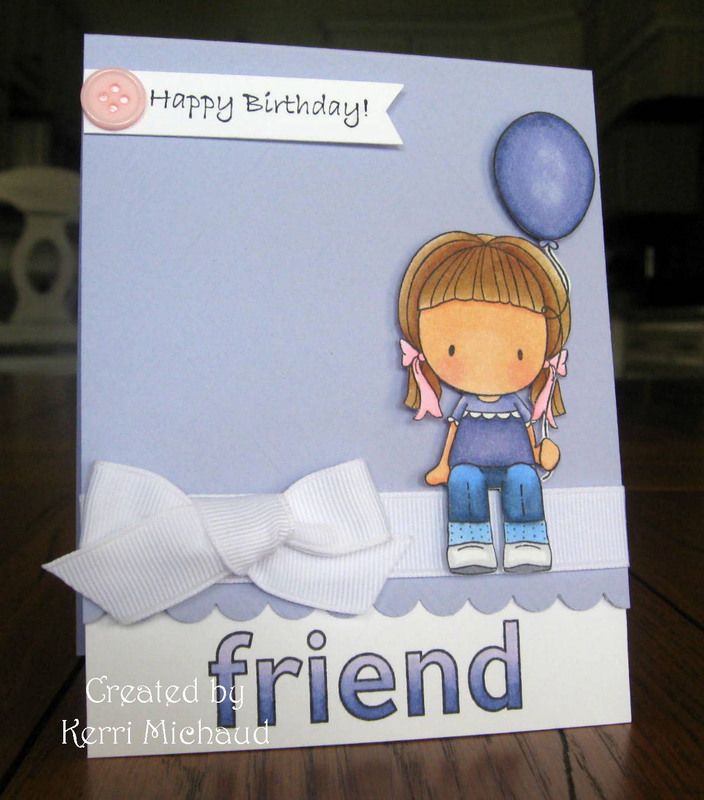 And what a pretty friend card! It is always emotional to see how our kids start something new in their lifes! Wishing your daughter a fun school year! Soooooo cute!! Your coloring is fabulous!